With the knock of March 2016 Audi RS3 Sportback has made its place on the UK streets. The model is very well designed featuring lightweight and thus offering lot of power through its engine. Apart the five door and five seater RS3 Sportback also features world newly designed exterior befitted with spacious and comfortable interior. Let us move ahead without spending more of time and get to know little closer about this newly released model from the house of Audi. The interior of Audi RS3 Sportback 2016 is standard and comfortable with the fine nappa leather upholstered seats contrasted well with rock grey stitching. The beautifully designed dashboard holds a remarkably positioned multifunction sports steering wheel covered by the works of leather and Alcantara. The instrument panel holds with it eye catching dials featured in combination of red and black. Apart the Audi RS3 Sportback also brings with it a driver information system with various vital information, electrically folding color screen, navigation, Bluetooth, front seat heating and parking system plus, giving you a comfortable tech featured ride. 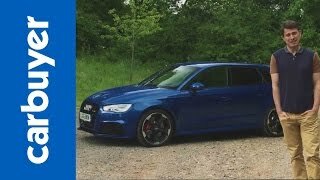 The exterior of Audi RS3 Sportback 2016 commendably compliments its interior. The honeycomb single frame grille, LED headlamps and daytime running lights with front wings and over the 19 inch wheels leaving no space in arches makes the front fascia worth a second look. Talking about the rear fascia you might find your eyes glued at large roof spoiled, black diffuser subordinated by Oval shaped RS tailpipe and yes at the aluminum look mirror housings as well. The exterior of RS3 Sportback comes in eight paint finishes to satisfy needs of all class and sector. 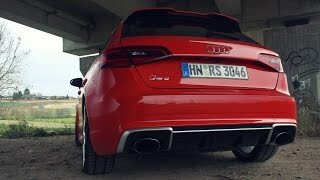 The Audi RS3 Sportback 2016 gets its power through a 2.5 liter TFSI 5-cylinder HP engine. We would like to bring into your notice that the mounted engine is claimed to be the most powerful engine in the entire Audi family and perhaps this only seems the reason behind its robust 362 hp power and 465 nm torque mated to seven-speed S tronic twin-clutch transmission. 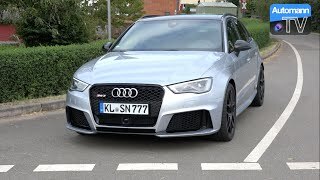 The engine thus is capable of taking the RS3 Sportback 2016 to a top speed of 155 mph; however the same can be optionally increased to even 174 mph, talking about the 0-62 mph sprint (0-100 km h), the Audi RS3 Sportback is capable of finishing it in just 4.3 seconds. 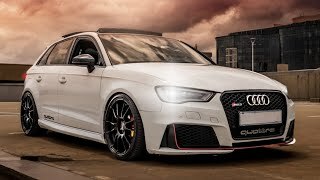 Before we sign off after sharing these all whooping specs and features offered in the all new Audi RS3 Sportback 2016, we would like to bring into your notice the UK price of model, which brings the needle to a starting price of 39,950 Euros (approx US $44,834).